"Ink Stain Design developed a website that met all our goals. They provided excellent service and delivered a great product on time and to budget." You wouldn't go to a business meeting in your pajamas. So why compromise on the appearance of your business materials? Ink Stain Design knows how to use graphic design to convey the message that you want in a way that stands out from the rest. Take a look at some of the work we've done recently and then give us a call about your project, or fill out a free estimate request. 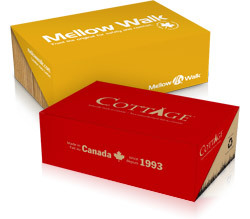 Mellow Walk operates the last shoe factory in Ontario, where 40 pairs of hands make each and every shoe. Mellow Walk wanted to emphasize the hand-crafted quality of their footwear on these new hangtags that come attached to each new pair of shoes. 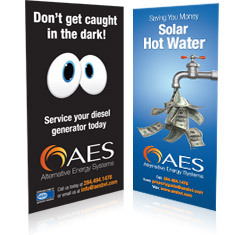 AES actively promotes their alternative energy services in newspapers and magazines througout the British Virgin Islands. 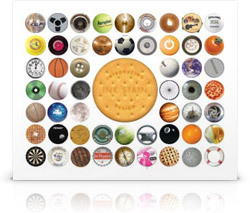 Each ad utilizes a distinctive image to promote a single service while also reinforcing the AES branding. 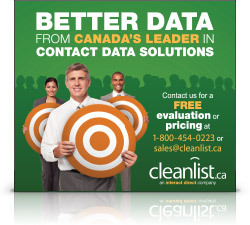 Cleanlist.ca requested ads that could communicate their position as a leader in contact data solutions, and also stand out in a busy trade magazine layout. 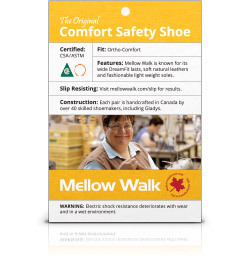 Mellow Walk is Canada's leading brand of steel-toe comfort shoes. For their new shoe boxes, they wanted two-color designs that would further promote and establish their brands in stores. This postcard was created to promote Ink Stain's launch. The unique design on the front not only ensured that the message on the back was read, a few postcards even made their way onto refrigerator doors. When's the last time you saved junk mail? 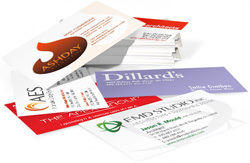 Did you know that 90% of business cards wind up in the trash the same day they're received? A business card can be a very effective and inexpensive marketing tool, and a distinctive design will not only create a positive impression of your product or service, it will also keep your investment out of the recycling bin. You've got nothing to lose by filling out a no-obligation free estimate request.